AUTUMN SPICE BUNDT CAKE — This autumn inspired bundt cake features a ribbon of spiced pecan streusel throughout. I don’t know what it is about bundt cake, but somehow a cake just taste better baked this way. And this Autumn Spice Bundt Cake is one of the best cakes I’ve made in a long time! 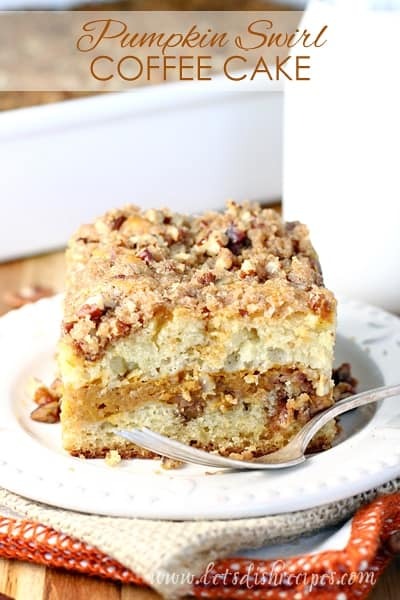 I just can’t say enough about the amazing texture and flavor of this cake! And when you add a ribbon of spiced pecan streusel and a drizzle of Pumpkin Spice Caramel Sauce….well, it’s pretty much bundt cake heaven! 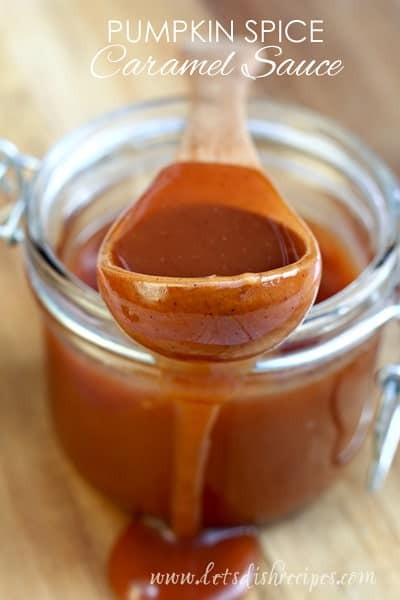 And if you don’t want to go to the trouble of making our own sauce, a store-bought caramel sauce would be wonderful too. But don’t just take my word for it. My neighbors loved it too! We decided to share because we really didn’t need to finish off an entire bundt cake ourselves. When we saw them the next day, they couldn’t stop raving about how delicious this cake was. Part of what makes this cake so moist and delicious is the brick of cream cheese that’s added to the batter. Not to mention the dash of pumpkin pie spice. Everything comes together in a beautiful dessert that is elegant enough for any holiday or autumn get together. I always use Baker’s Joy for preparing my bundt pans, but the good, old-fashioned grease and flour method will work too. And you could certainly use walnuts in place of the pecans, or even use a combination of both. This is a cake you will be proud to serve company. It’s certainly earned a spot in my permanent recipe collection. Be sure to save this Autumn Spice Bundt Cake recipe to your favorite Pinterest board for later. 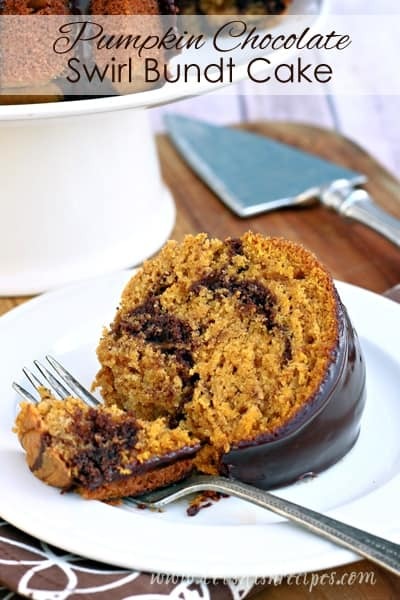 This autumn inspired bundt cake features a ribbon of spiced pecan streusel throughout. Generously grease and flour a 15-cup bundt pan. In a large bowl, beat butter and cream cheese until fluffy, 3-4 minutes. Add sugar, 1 cup brown sugar, and salt. Beat on high speed for 8-10 minutes, stopping to scrape sides of bowl. Add eggs, one at a time, beating well after each addition. Mix in vanilla, flour, 1 teaspoon pumpkin pie spice, and baking powder until smooth. In a small bowl, stir together pecans, remaining 1/3 cup brown sugar, and remaining 2 tablespoons pumpkin pie spice. Spoon half of the batter into the prepared pan. Sprinkle pecan mixture over batter. Top with remaining batter. Using a knife, pull blade back and forth through batter to swirl. Smooth the top with of the batter with an offset spatula or the back of a spoon. Place the cake in a cold oven. Set temperature to 300 degrees and bake until a wooden pick inserted near center comes out clean, approximately 1 hour and 20 minutes. Let cool in pan 10 minutes before turning on to a wire rack to cool completely. Slice and serve with caramel sauce, if desired. Pumpkin spice not available in Australia. What can I use instead? I would Google “pumpkin pie spice recipe.” I know there are lots of recipes out there using things like cinnamon, nutmeg, cloves, ginger, etc. That would give you the proper proportions of each.